I listened to The Five Love Languages by North Carolina author Gary Chapman this past week as I traveled back and forth to the day job. A friend had mentioned reading it several years ago and I always intended to get it, so I was excited to find that the library next door to my office building had the audio version. And as I listened, I couldn’t help but wish I had read it years ago. I discovered my own love language and possibly my husband’s love language. So what is my love language? It is certainly not the language of “receiving gifts”, although it is pleasant to receive them. My love language is quality time. I need time with my loved ones. I need to know that they want to be with me. Not necessarily spending the whole time talking either. Just there, together–sharing experiences, favorite TV shows, eating, etc. There was a time when my husband was working seven days a week and sometimes 12 hours a day. I was miserable. I felt unloved. And our marriage was less than perfect. My love tank was empty. So, how does this relate to writing fiction? I’ve been pondering a situation in my current work in progress, Eve’s Apple. I had the privilege of receiving a critique from an editor whose authors have gone on to final and win Christy awards. And she questioned a plot point as not being a strong enough incident to keep the hero and heroine apart. So I’ve thought and thought about what would make my plot point more acceptable. And after listening to The Five Love Languages I realized my male character’s love language is “words of affirmation”. He needs to be praised by those who love him for him to feel loved. And when he thinks he hears the female character call him a name, it devastates him. Because he is hurt by her, he no longer considers her a candidate for his wife(since he had decided it was time for him to marry). If you write fiction and you keep a character questionnaire, maybe add “Primary Love Language” as one of the considerations when you develop your characters. I had the flu the last weekend in February, so I had time to read a novel that had been on my “to read” shelf for quite some time (along with 100 plus books, I’m afraid). 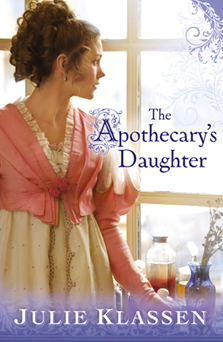 I received a critique of my novel EVE’S APPLE last May from the editor of The Apothecary’s Daughter by Julie Klassen. As I read the novel, I couldn’t help but think, there’s no way this publisher would ever publish me. Julie’s writing is so far superior to mine. As Lilly toils in her father’s apothecary, preparing herbs and remedies by rote, she is haunted by memories of her mother’s disappearance. Villagers whisper the tale, but her father refuses to discuss it. All the while, she dreams of the world beyond—of travel and adventure and romance. When a relative offers to host her in London, Lilly discovers the pleasures and pitfalls of fashionable society and suitors, as well as clues about her mother. But will Lilly find what she is searching for—the truth of the past and a love for the future? Enjoyable read by a Christy Award winning author. 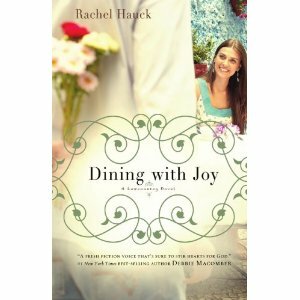 I purchased a copy of Dining With Joy by Rachel Hauck at the going-out-of-business sale at Borders in Chapel Hill. I love the premise: A cooking show host that can’t cook. I so identify with the not cooking thing. Although, I’m not that bad. I at least can boil an egg. Enjoyable read. My husband plans to read it too(a closet romance reader). He likes to cook and he likes softball which the main character loves to play.